This summer has not been a scorcher like we have grown accustomed to around these parts. We have even had some downright cool days, especially considering this is usually the hottest part of the year in the DC region! That’s my excuse, at least, for why I made a meal more closely related to fall or winter cooking. Nothing like coming home on a dark, cold evening to a roast waiting in the crock pot. It even tastes pretty great in the summer, too. Instead of the classic beef or pork, this roast was made with some Grade-A Colorado venison tenderloin. The fact that I got potatoes and onions this week, combined with carrots from last week, meant a roast was the obvious choice. 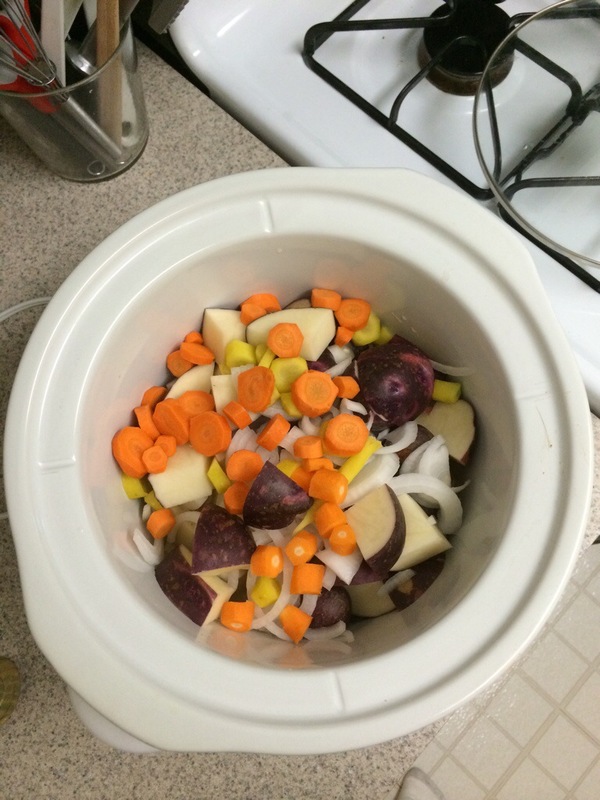 As with most crock pot recipes, add all the ingredients, set on low for the day, and let the crock pot work its magic. Potatoes, onions, and carrots for pot roast base. Naturally, I was too busy digging in to get a photo of the finished product. 1. Cut potatoes into quarters and cut carrots into medallions. 2. Add potatoes, carrots, and onion to crock pot, placing venison on top. 3. Add garlic and mustard, and pour soup and water over the other ingredients.